Follow me on Twitter @TheTikiChick, Google + or Instagram or like The Tiki Chick on Facebook to find out about more new tiki bars, upcoming events and what I’m drinking at the moment. And check out how I turned a closet into a tiki hut mug display! We are looking for photos of the Don the Beachcomber (formerly Tonga Lei) that used to sit where our hotel is currently located at 22878 PCH in Malibu. It was torn down in the 80’s. We’ve found photos of the building when it was Tonga Lei, but we’d love to find one of the exterior when it was actually Don the Beachcomber. We found your site (what fun!) and thought you might be able to help…? We’d be so very appreciative if you have any tips or suggestions! Thanks, Tiki Sasquatch. I really dig your blog, and I admire you for posting daily! I work at a great establishment in a town called Ortonville, MI called Bullfrogs Bar & Grill. 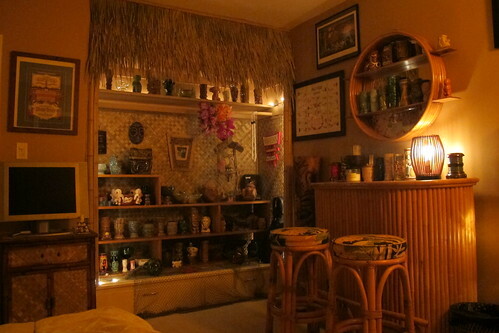 We have a brand new Tiki Bar that is pretty big and with a great lakeview. Always looking for great advertising and reviews how can I get on your website? If I’m ever in the area, I’ll be sure to drop in! Great website, which I just stumbled upon as I was researching the CALIENTE TROPICS Motel in Palm Springs. Anyhow, my query to you is: what did you think about your stay at the Caliente Tropics Motel ? Is there any restaurants or bars LEFT on the premises ? Is it all run down due to a lack of interest (and respect for) the motel’s history ? I’m aware of the Motel’s history…And it seems like its been well-maintained by the current owners, but I am questioning this due to other tiki posts I’ve read as I have been doing my research. Any info you could provide me would be most appreciated !! Great site! Just added you to my Grogroll at tradervince.com if that’s okay? Great meeting you too! Thanks for the lovely words. Catch you on the flip side! Did you attend Rumfest in London? Tiki Chick I LUV U! Can I send you an EP of my music? Sure, I’d love to hear it! Love this blog! I had to buy a couple of episodes (via amazon video) from your Tiki TV section. Great stuff. Not sounding like a self promoter but you should check out southseascinema.org we have a serious web page there titled South Seas TV (aka or as you call it Tiki TV). If you like it would you consider adding it to your Essentials list (links)? Keep up the good work and keep the Tiki’s coming! Mahalo nui. We have a couple members of our Sciety in L.A. so they send some neat e-flyers from the Egyptian about those South Seas movie nights. I told you the site was serious, about 15 years of research from 4 guys. Thanks for checking it out. 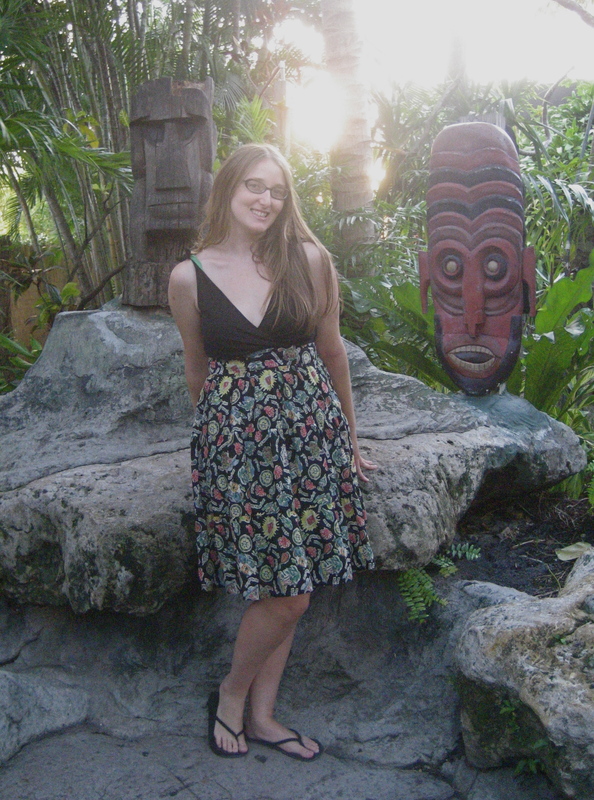 I think in the furture we will have a pure Tiki section with a bunch of Tiki screen captures like you have. I’ll be checking your site regularly – everyone keep watching for Tiki on TV and report it here to the Tiki Chick. I work for a design firm that worked on Psycho Suzi’s and I am interested in the possible purchase of some of your photography. Please contact me at info@shealink.com. Hi, just wanted to let you know I am auctioning a Shag & Paul Frank = “Sylvie and Jules” serigraph, #’d 88/100 on ebay..I know these don’t come up for auction or sale much so I thought I would let you know– Here is the listing, in case anyone is interested. I was just hipped to your blog this AM, super 🙂 Thought you might be interested in knowing about a Martini Kings vinyl LP with SHAG artwork that I’m releasing in July: http://www.dionysusrecords.com/home/2012/05/martini-kings-release-vinyl-lp-with-shag-cover/ – Contact me directly if you want a digital download coupon so you can hear the album before it comes out! Would it be possible to send an e-mail to you? Can you be contacted at an e-mail address through this website? I’ve been receiving your postings since the beginning of this year. Thanks for the good work. Aloha Tikichick, nice work wahine really like what you are doing! Please drop me a line I have some stuff you will love to see. Thank you! You’ve got a great site — I added a link to it under Tiki Essentials. Really awesome blog. I borrowed some of your pictures from Tiki No. I credited you on the pictures. I also left a link to your blog, so you might get some traffic from it. Please let me know if it is okay that I used the pictures. No problem, thanks for the heads up! interested in writing some blog posts depending on your availability. Feel free to message me any questions! Aloha! Early yesterday at a New York health club’s daycare facility I turned a “Crusin’ Exotica” arcade game 90° so that its tiki chick, who bears a remarkable resemblance to a former club worker (a Bhutanese gal), would no longer face the wall, as she had for over a year. And yesterday evening, the former club worker posted photos of her wedding engagement ceremony on facebook. Tiki charm!